Everyone is invited to attend this chapel series. 11am in 141 on Thursday. The final one will be May 1st. If you need extra chapel credits join in! before the Scholarship awards are announced. Scholarship award winners are not always the same people who got work into the show. 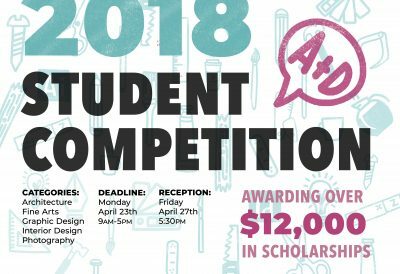 We have scholarship award categories for Art History, growth in design, etc etc. Work that did not get in the show will need to be picked up next week from the hallway because we have no place to store it. Please join us for a come and go retirement reception honoring Jack in Shore Gallery on Monday between 4-5pm. You should all have your review appointments set up and be working through the assignments on canvas. Remember to hashtag your work! Enter. Enter. Enter. 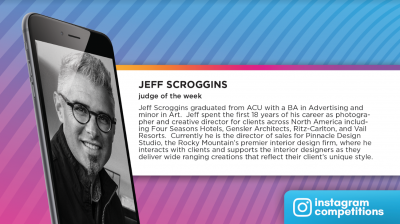 Jeff Scroggins is our current judge. Currently Jeff is the Director of Sales for Pinnacle Design, an Interior Design firm in Colorado.